This Smoking Dogs production for BBC2 and PBS, directed by John Akomfrah, is perhaps the best television programme I’ve ever seen. There are three reasons why I say this. First is the political and historical importance of the material. I can’t say that I appreciated it at the time, but only a few years later I think I recognised the political import of Martin Luther King’s speech on that August day in 1963. Second, I was blown away by both the range of archive material that the researchers had found and by its quality. Here was film footage of every crucial moment of the story of the preparations for the march as well as the event itself – and mostly looking as if it was shot yesterday. And thirdly was the skill involved in the editing process which stitched together archive and contemporary interview footage with a subtle underpinning soundtrack of electronic beats and synths to accompany Denzel Washington’s expertly delivered narration. If you missed this, look out for it on iPlayer and YouTube – I’m sure it will appear somewhere. I thought I would enjoy this movie and I did. What I hadn’t expected was just how emotional it would be and how rooted in the experience of the filmmakers. I think it’s one of the most enjoyable films of the year. This makes it even more distressing to see some of the inane comments on IMDB and some of the bland (even if generally favourable) reviews in the UK. 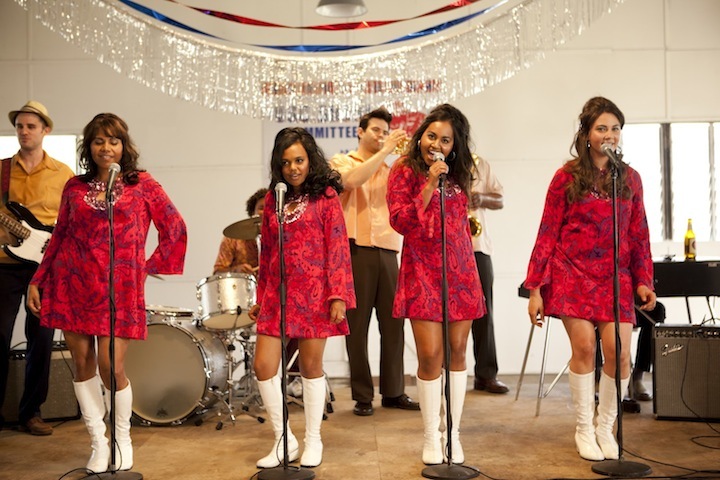 So let’s be clear, this is an Australian movie from Goalpost Pictures, adapted from a stage play based on a real story about an Aboriginal girl group from the 1960s which toured Vietnam entertaining American soldiers – in itself interesting since Australian forces also fought in Vietnam. The attraction was that the women were playing to African-American troops and this is a film as much about racism in Australia as it is about ‘sweet soul music’. The Weinstein Brothers got their hands on the film after its Cannes screening earlier this year and they have been promoting it in such a way that most reviewers can’t get beyond comparing it to Dreamgirls, The Commitments or even Good Morning Vietnam. There are some elements in common with each of those films and the writers cite The Commitments as an influence on their approach, but for me The Sapphires is much more interesting. It’s written by Tony Briggs, whose mother and aunt were in the original group, directed by Wayne Blair who himself starred in the original play and photographed by Warwick Thornton who directed Samson and Delilah (Australia 2009). This trio of Aboriginal filmmakers, with co-writer Keith Thompson, were at the centre of what the producers have described as the strongest creative team on a recent Australian production. The press kit gives a great deal of background on the film and is recommended reading. The premise of the film is simple. It’s 1968. Three young women are still living with their extended family in an Aboriginal community of Yorta Yorta people in the Murray river area which forms the border between New South Wales and Victoria. One day they are spotted by a down-at-heel Irishman (Chris O’Dowd) who is working as an MC for a local pub’s talent contest. This leads in turn to a decision to audition for the US Army which is recruiting entertainers for its troops in Vietnam. So far, so conventional, but the trip to Melbourne also involves finding ‘cousin Kay’ who they haven’t seen for several years and who makes up the fourth member of the group. Kay is ‘passing for white’ in Melbourne having been ‘stolen’ by the authorities ten years earlier. This reference to the trauma of the stolen generation, both for the light-skinned children and their families, will drive several strands of the narrative during the film and provide some of the most powerful emotional sequences. The history of Australian policies towards indigenous Australians is brilliantly presented in Rabbit-Proof Fence – in which Deborah Mailman (Gail in The Sapphires) also appears. Most of the remainder of the film takes place in Vietnam with mainly predictable developments involving the girls with GIs and Chris O’Dowd as a loveable but rather hopeless manager. The war scenes were mainly reconstructed around Sydney – but some material was also shot in Vietnam. The film isn’t perfect by any means – two of the girls have stories that don’t seem to move forward very much. But this isn’t a film about narrative complexity. To work, it needs to do two things well. The first is to give us a real insight into the relationship between the Aboriginal communities in Australia and the Civil Rights movement in America as experienced by the families – and to do this with a sense of authenticity. The second is to present great-sounding music. These two aims are linked since it was Memphis soul (alongside James Brown and Curtis Mayfield) from the late 1960s which provided the soundtrack for the Civil Rights Movement. (See our posting on Talk to Me.) I can’t be a distanced observer here since I grew up with this music, but I thought the singing (and the US backing band) were excellent. The lead voice comes from Jessica Mauboy, runner-up on one of the Australian Idol shows and, I think, now a major pop music star. Perhaps more surprisingly, as a relatively unknown performer, Shari Stebbins as Kay also sings very well. These two, along with Miranda Tapsell, come from the Darwin area on the Northern tip of Australia. The producers tell us in the Press Kit of the difficulties of finding four Aboriginal women, at least one of whom had a strong lead voice and the other three having voices that produced the right harmonies. At the end of the film, we get to see the original group and the women who went to Vietnam. It’s clear that the production team chose the performers well. I should also add that Chris O’Dowd does very well to hold his own against the four women. My only regret about the film was that I’d have liked more of the group singing Merle Haggard – but perhaps I’m the only one. The film has done well in Australia taking over $14 million. In the UK it is distributed by eONE Entertainment, the newly expanded Canadian major. According to Screendaily the film was released on 233 screens for No. 7 in the UK chart and a weekend total of just over $500,000. Strangely, in West Yorkshire it was on only one screen at the Showcase in Birstall. Where are all the other screens? If you like soul music, you’ll like this – but do read the Press Kit afterwards. This is what works as a Friday night feelgood movie for me. Interesting report on the film from The Australian.